Dan Knight over at Low End Mac posted a great article on how to make a G3 iMac useful. It’s no surprise that I’ve used Dan’s site as a tool ever since I got my own second-hand Bondi Blue iMac, complete with original keyboard and puck mouse, at a recycling e-waste drive. This happened right after I got my first Mac, my iBook G4, and it gave me a chance to play around with OS 9 and the original Mac interface. It also kick-started my love of classic Macs. The Bondi and I go way back. Mostly, it’s just nice to look at. The sloping curves, the aqua-green shading, the gum-drop shape – sometimes it’s hard to resist waking it up out of sleep to log on and play around with the OS. In fact, it’s the one classic Mac I use on a regular basis. At least once a week I fire it up to do several things, both for business and pleasure. My iMac came pre-installed with a copy of Quicken 2000, a comprehensive record-keeping software package. The interface is a bit crude, and a lot of the online stuff doesn’t work like it used to, but it serves my purposes just fine. I use Quicken as mainly a month-in-review system. Every month, I get my credit union statement and log all the transactions for the month. I have one “checking” account, two “savings” accounts, a few club accounts, and all my loans tracked through Quicken. Quicken gives me a big-picture view of my finances, handy graphs and charts to track my spending, and the most comprehensive record of my accounts since 2006 – which is why I make sure to backup my file every time I use it. Each month, I take the 15 or 20 minutes it takes to log all my transactions into the system, and check through the pie chart that tells me where my money goes each month. Then I peek at the bar graph that shoes my income vs. spending, and I hope the “income” bar is higher. My iBook came with a copy of Quicken on it, too, but I like the mouse-and-keyboard combo on the iMac, and it gives me an excuse to turn the Bondi on at least once a month without fail. You can’t beat free, and chances are your OS 9 Mac came with a copy of Quicken, too. This is where my iMac gets the most use. Let’s start out with “WarCraft II.” I got hooked on “WarCraft II” in high school, and I have fond memories of wasting many hours launching my human and elven hordes against the evil orcs and their dragons. Before “World of WarCraft,” “WarCraft II” was a strategy game that pitted your army versus the forces of good or evil, depending on which side you took and how many resources you could accumulate. It’s a blast, and it’s highly addictive. I bought a copy of “WarCraft II” on eBay, but after having trouble installing the expansion pack on OS 9, I contacted Blizzard and they sent me a free copy of the most up-to-date software version, “WarCraft II: Battle.net Edition.” Now I can go through the story mode, build my own maps, or head online to battle other players on the still-functioning Battle.net system. There are “WarCraft” players on Battle.net that have far more skills than I do, but it’s still fun to battle against a real human – as opposed to the usually stupid computer. The other game I play is “SimCity 2000,” another classic that I played a lot in high school. The “Sim” bug first bit me on the Super Nintendo’s version of the original “SimCity,” and I grabbed a demo copy of “SimCity 2000″ when I was a teenager. I was hooked. And now, at long last, I have a full retail version to play on my iMac. “SimCity 2000″ lets you build a city as big or as small as you want, with varying landscapes, building types, and disasters that can ruin or strengthen your town. It switches to 256-color mode on the iMac, and it runs like a dream. The one game I still have to find is a copy of “Star Wars: TIE Fighter,” the space shooter that lets you be an Imperial pilot, flying missions for the Empire. Dog fighting, it seems, is in my blood. Ah, the real grit here. 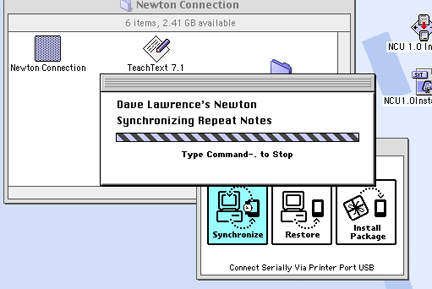 Since my experiments in syncing my eMate with OS X have been hit and miss (mostly miss in regards to dates and contact syncing), Newton Connection Utilities, for the eMate, and the Newton Connection Kit, for my MessagePad 110, are still my best options for backup, package installation, and data input. Since the iMac only comes with USB ports, I use a pair of serial-to-USB adapters that let my Newtons talk clearly with OS 9. Both require a driver, but they work great. I use the iMac as kind of a homebase for my Newton software, too. All my packages are saved in my Newton folder, as are any backups NCK and NCU make. Just in case something happens to my Newton in the wild, I’ll have all my information stored and saved for emergencies. Finally, I use my iMac as an easy way to mess around with the classic Mac operating system. Through the Bondi, I’ve learned what the Apple Menu could have been on OS X, how snappy and elegant the UI is, and where the pioneers of Mac software got their start. There are some things I don’t miss. Extensions are the big feature I like not thinking about. I wish there was a modern, capable OS 9 web browser. Speaking of browsers, I have three installed on the G3. The first is Internet Explorer 5.5, which came installed on the system. Since IE has trouble with CSS and rendering a lot of modern web pages, I downloaded iCab and Mozilla, too. iCab gives me mixed results, and I don’t use it very often. Mozilla’s browser (above), however, is my favorite. As the precursor to Firefox, it seems to handle most web sites with ease. It’s not a fast browser, even with broadband, but Mozilla is fast enough that if I need to download a .pkg file off UNNA, it can handle it. I snagged a copy of Adobe’s old web creation application, PageMill, just to mess around with. I also have a copy of Photoshop Elements that lets me edit screenshots for this blog. The one project I have yet to try is to get my iMac G3 on my home network, with full access to my external hard drive. Is this possible with an Airport Extreme base station? I don’t know, but I’m going to try. Two more iMac G3s, the Rev. C “fruity” versions, came my way after the Bondi. I fixed up both of them and gave them away. For one, I installed every OS X version up to 10.3 Panther, with extra RAM, and it handled them all just fine. The other came with an OS 9 version of Microsoft Office, so I left that one alone. But my Bondi does just fine with OS 9. It gives me a chance to play some classic games, explore the older Mac operating system, and own a piece of recent Mac history. It would be nice to have more RAM, USB 2.0 hubs, and a modern web browser, but for my projects it gets along just fine. Posted by davelawrence8 at 6:34 am on December 29th, 2008. 8 comments... » Categories: lowend, macs, software. Tags: apple, bondi, G3, imac, mac, messagepad, newton, OS 9, quicken, simcity 2000, sync, warcraft. Subscribe via RSS. I’ve got 2 imacs over here, I’ve been wanting to pull them out and put OS 9 on them…still hunting down the disk however. I really like using the classic mac os for random things like you described. 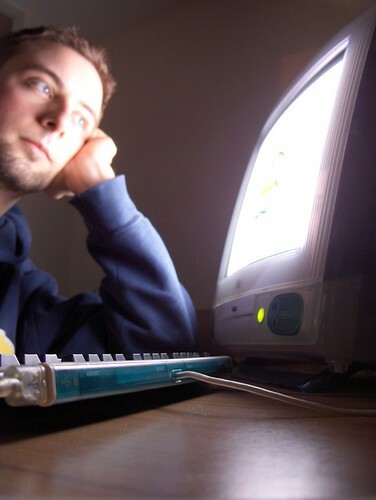 I had one setup once as a dedicated email machine once, and it worked like a charm. Posted by Erik on December 30th, 2008. Thanks Erik. It’s not the adapter I’m after – I don’t need the iMac to go wireless, just for it to connect with the Airport Base Station’s USB hard drive. I’ve got a run-of-the-mill network going on, except for the G3. Posted by davelawrence8 on December 31st, 2008. 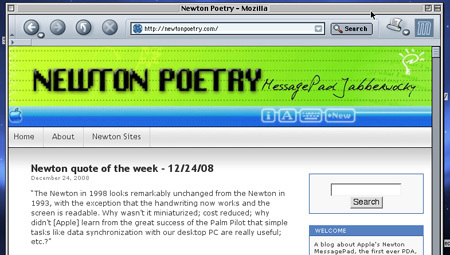 Posted by Newton Poetry — Last Year’s Model on November 19th, 2009. Posted by Newton Poetry — Cleaning out my Mac closet on October 4th, 2010. Just “rebought” my Grape iMac on eBay. I had to basically give away my original when we moved a couple of years ago. What I paid something like $1300 for in 1999 I just got for $72, shipped. Actually a little better because mine was a 266 and this is a 333. I agree with everything you said about the classic OS, browsers, and gaming. The game I was most excited about was MYST – the original MYST (or at least the one I had on CD circa 1999). Really haven’t been able to find that for any other platform. 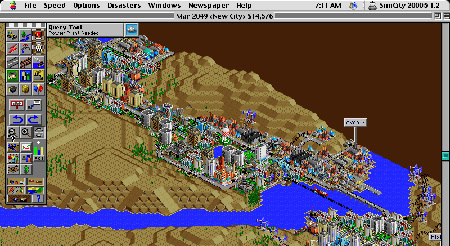 Bought the wrong version of SimCity (only works in 16 colors) so I think my memory was faulty – I apparently was playing SimCIty 2000 back in the day. As far as browsers – not much luck there – iCab is very slow – Netscape works, sort of. But browsing the web is really not the point. In fact – having something completely offline is intriguing. Like Battlestar Galactica. Posted by Matt on June 18th, 2011. Agreed: sometimes the offline approach is good. It frees us from distractions. Posted by davelawrence8 on June 20th, 2011. Posted by Sink Different: Macquarium Gives Used iMacs New Life | WebUrbanist on November 6th, 2011. Posted by BDD on March 23rd, 2012.